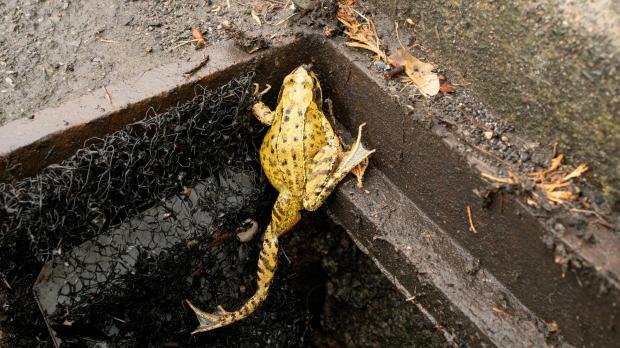 A small group of British conservationists are installing mesh- covered ladders in roadside drains to save trapped amphibians from certain death. The Warwickshire Amphibian and Reptile Team - the memorably acronymed WART - hopes that by placing 20 of the rust-resistant aluminium ladders down drains near known breeding pools in England's West Midlands, they can boost the dwindling amphibian population. "The amphibians are coming to breed and then hitting the road, getting across the roads, hitting the curb, along the curb and into the drains. And then that's it - end of story for them, game over," said Tim Jenkins, a ladder fitter at WART. "By installing the amphibian ladders, it enables them to get back out of the drains and back to their breeding pools and doing what they should do and making more amphibians." WART says it's seen a drop in the number of amphibian prisoners since the ladders were installed, but there is a limit to how much they can do. Each of the ladders designed by the British Herpetological Society costs £15, a large price for a local conservation group. The group hopes their endeavours can inspire other conservation groups in the UK to help the oft-maligned critters. "They're an overlooked species and they have their role in the ecosystem. They're absolutely excellent for gardens because they eat lots of invertebrates - potential pests in your garden," Jenkins said.